Ten Bands on Two Stages including the GrassRoots Dance Tent. 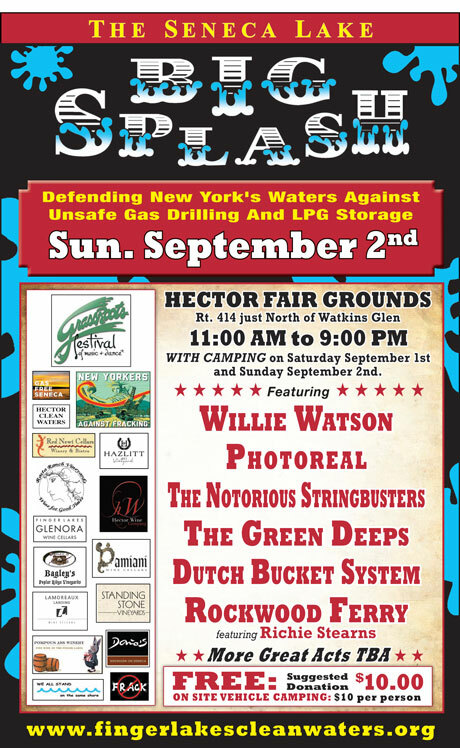 The event of the Summer, last years Seneca Lake Big Splash featured, Jim Lauderdale, Willie Watson with the Evil City String Band, and Sarah Lee Guthrie. This years event is shaping up nicely and we’ll keep you posted as the line-up comes together. Educational speakers and citizen groups will be on hand to provide factual information on the dangers of hydraulic fracturing. This is a camping event both Saturday and Sunday night. Admission is a $10 suggested donation and camping is $10.00 per night.